The other day, I was watching some Spanish TV programs at home and one of the commercial was about chipotle burgers available at Wendy's. The commercial was of course in Spanish and in the end, the advertise line was "Mucho Mejor" which I've never heard or seen before. So I looked for the press release on Wendy's webpage and other news sites to learn the "Mucho Mejor" more. * "Mucho Mejor" means "much better" in English, FYI. According to Wendy's news released, issued on May 13, 2013, Wendy's is rolling out a new wave of Hispanic advertising with the goal of creating a stronger connection with this fast-growing demographic, which makes up nearly 17 percent of the U.S. population. The Mucho Mejor Hispanic advertising campaign would reinforce Wendy’s shared values with Hispanic families, focusing on the best in family and food. "Mucho Mejor," would become the new Hispanic advertising tagline and complements Wendy’s mainstream "Now that’s Better" campaign. The Mucho Mejor campaign is the next evolution in the company’s Hispanic advertising strategy. In 2010, the company and its Hispanic agency Bravo launched the “Sabor de Verdad” campaign, which focused on Hispanic customers’ savvy and appreciation for real, quality, tasty food. And an article mentioned that among McDonald's, Burger King, and Taco Bell, Hispanics are least likely to visit Wendy's. Like other fast food chains, Wendy's is focusing on Hispanic customers and trying to make it work. 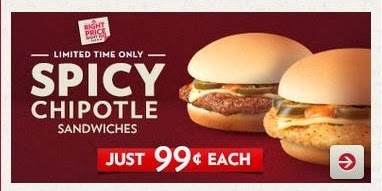 Getting back to the Wendy's Chipotle Burgers, they have 2 types of chipotle burgers. 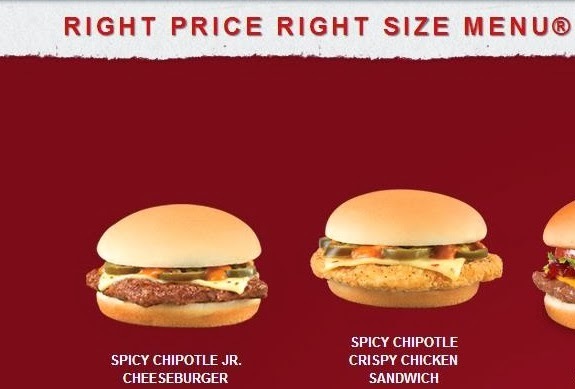 One is Spicy Chipotle Jr. Cheeseburger and the other is Spicy Chipotle Crispy Chicken Sandwich. I chose cheeseburger to try but on the menu, it didn't say "chipotle" so I was a bit skeptical that the branch I went to had this or not. When I was at the cashier desk, I asked if they had chipotle burger, then they said yes and it's called (and written) "Spicy Cheeseburger." --- It's not coherent as the webpage they call it "Spicy Chipotle xxxx" and it's hard to think it's the same thing. Mmmm??? Nothing resembles the photo on the web. Had a bite, but not spicy. I think these slices of jalapeno were spicy but the sauce itself wasn't spicy. It was more like tomato paste with herbs and spices and a little bit of spiciness. As it's limited product, I was gonna try the crispy chicken sandwich, but I'm not sure if I'll be willing to try that one as it's technically the same but crispy chicken instead of beef patty. I thought it can be a combo but as it's 99 cents menu, there's no combo available. I added small diet coke and small fries. Spicy JR CHZ: 1.09 dollars --- even the receipt says only "spicy"
I didn't really understand the trick of the price for the burger as the website says it's 99 cents. My husband said maybe in Manhattan and some other cities, they don't have national price. I've been a couple of fast food restaurants and they don't ask if it's here or to go, and they just give us a bag of foods and soda. Also on the receipt, it says "to go" even though I didn't say anything. In Japan, they ask you if it's here or to go, then if it's here, they prepare foods on a tray and give you food and beverage on the tray to bring it to a table. To receive a bag and open to eat, then throw the bag away in the restaurant is weird to me.